You are a former Brit who spent a good part of your working life as an alpine skiing instructor in Scotland. How serious were you as a runner in those years? started in about 1984 in order to get fit for XC skiing but continued running, not the XC skiing. I trained alone mostly and did a few marathons and hill racing for 2 years 1998/99 – nothing short, mostly long distance. On moving to Australia, you joined the Sydney Striders, and then to Sean Williams’ squad. 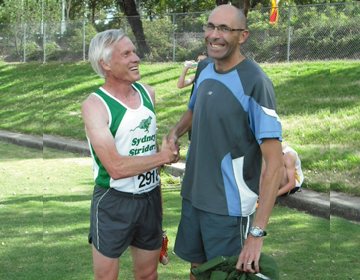 How did joining those two groups help your running in your early years on Australia? What is it like being coached by Sean Williams? Great – he thinks for me and guides me very well. Some people regard you as the World’s Greatest Masters Runner over the last decade. Your world records, gold medals and achievements are mind-blowing. 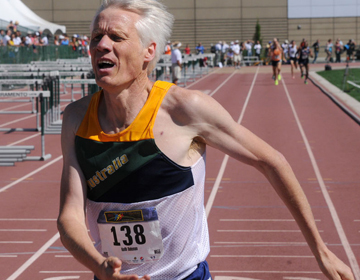 What are the keys to your continual rise in World Masters running? First is good technique and everything else follows from that base. I feel there is no point in running long and tired/badly as that just makes one good at doing that. So it’s technique first and everything else follows. I am constantly thinking of my form and feeling my landings and adjusting – that’s why I love barefoot as I can be much more precise. What are your upcoming running and racing goals? I’ve had a couple of years taking it easy; just technique coaching and running with Heidi and I have just started to get to regular training. I am waiting until I get my speed fully back before I race seriously – I hope that’s in before 2015. I want to crack my 15:29 for 5km and the 1mile before I hit 60 next June. Running technique has obviously been an instrumental measure of your success. Name three changes that you have made to your running technique which have assisted your speed and endurance. That’s a difficult one. It’s been gradual. However, the most important thing has been to remove my over-stride. That is braking caused by the foot landing in front of the hips. Landing my foot under the hips has strengthened the right muscles and enabled my to get a ‘recoil’ with improved glute, calf and foot strength. So to answer your question. 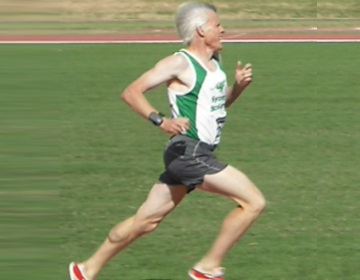 sure my heel was travelling towards the back of my thighs – I accelerated away from the opposition (That’s the direction the foot will travel if the form is good so recreating that actually creates good form – I call it ‘reverse engineering’). Going barefoot in training. That enabled me to feel my ‘balance point’, that I was landing whole-foot (with the foot right under the hips) and it also strengthened my feet so much that my podiatrist wife (Heidi Jones) has foot envy! What is your ‘pet distance’ and why? We all know that you do a lot of training and some races barefoot. However, in many racing circumstances barefoot simply isn’t a safe option. What are your favourite racing shoes/footwear? For bindies I use very thing vibrams. For road and trail I have use my very old ASIC Piranah SPs (very old because the beefed up the SP2 and ruined it). I have just got some Mizuno Universe Wave 5 (80g, not spongy and 1mm drop. That’s about the best I can find just now. You have an unusual apparel sponsor for an Australian runner. Ron Hill Sports is ‘British to the bone’ and owned by the Legend himself, Ron Hill. How did this sponsorship come about? I used to love their gear and the wrote and asked me if I would be prepared to use it! Easy! You recently married champion runner, Heidi Jones, who is also one of Sydney’s top running podiatrists. How has Heidi assisted you in your running success? Heidi came along after my running records but she has been amazing in cutting out foreign bodies that I have stepped on while running barefoot on the concrete! She has been invaluable in anatomy education and is fantastic at helping my technique-change customers with foot-strengthening and removing orthotics and chunky shoes from their lives for good. You have recently written a book. Tell us about it, and how can we buy it? The book is based on my running-technique sessions and include ALL the trick I use. It has taken two years to complete and Heidi has contributed dramatically with her professional podiatry advice plus her unique foot-strengthening program. We think there is nothing like this book which is built on my 30 years running experience and Heidi’s 30 years of running experience, plus my thousands of technique-change customers and Heidi’s 17 years podiatry experience. We hope the book will become the “running bible”, we think it is that important! We will have a book launch in Coogee weekend of 13th/14th December. It will be 10am – 4pm Sat and Sun with friends and runners invited to come along, read the book (we’ll have a few copies lying around for that) have a drink, a chat, something from the BBQ and generally chill out. Books will be available for sale It will be available from our website (olderyetfaster.com in printed, PDF, epub and mobi formats. Thereafter it will also be on Amazon and other sites. We are very excited about it!